Cute and Funny Pictures and more: Sir Kitty Cat on a Quest to slay the red dot! This is a cute night costume for a cat. I know people who actually make stuff like this, but it usually ends up on teddy bears. I have no idea how they got the cat to wear chainmail. It is heavy and not comfortable. So I have to say great job on creating the coif to fit a cat, and even better job working with the cat to get it comfortable wearing the coif long enough to get some cute pictures. This would be great for a Halloween costume, or a renaissance fair costume, or just something a person in the society of creative anachronism or any other re-enactment medieval group. 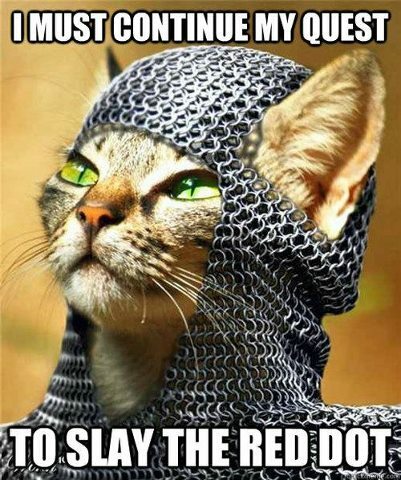 Personally I found the quest for the red dot was what made this cute and funny. My cats love to try and “slay” the red dot. It is fun for the whole family.